Christie Blatchford wrote a column, published Friday in the National Post, excoriating UBC for cancelling an appearance by John Furlong at a fundraising event. The university had received a complaint asserting that Furlong shouldn’t be given a platform to speak at UBC, because he’s been accused of abusing Aboriginal children when he was a teacher at Immaculata Elementary School in Burns Lake, B.C. You can read about those allegations in an article by freelance journalist Laura Robinson in the Georgia Straight. You can read more in CANADALAND’s coverage, too. As we’ve written previously, none of the allegations in Robinson’s article have been tested in court. There were two independent civil claims against Furlong that were eventually dismissed. Those suits were brought by individuals who were not written about in Robinson’s story. Robinson sued Furlong for defamation after he said she had a personal vendetta against him. Robinson lost that suit last year. Furlong’s lawyer, former lawyer, and speaking agent have all made the case that Furlong has been treated unfairly by UBC in the pages of the Post and the Vancouver Sun. In her column, Blatchford takes up their cause, writing UBC should never have caved to any public complaints, as Furlong had been “vindicated” following Robinson’s defamation lawsuit. You can read Blatchford’s whole column here. What follows is Robinson’s response, which she sent directly to Blatchford. Robinson also provided a copy to CANADALAND. We’ve lightly edited it to put some of the links directly in the text, correct a typo, and add a photo to provide context. Excerpts from Blatchford’s column have also been bolded to better differentiate them from the text of the letter. Please find below corrections re: your December 30, 2016 column. “The judge said, of the purported multiple declarations from alleged indigenous victims of Furlong’s alleged abusive conduct, only three had ever been ‘even minimally tested in a way that we, as a society, believe our system of justice requires when a citizen faces such serious and devastating allegations.’” Unfortunately, Justice Wedge made dozens of errors in fact. She incorrectly connected allegations of sexual abuse by Mr. Furlong, to my Georgia Straight article, which contained no allegations of sexual abuse. Two months after my story came out Grace Jessie West spoke to me for the first time and at no time did she allege sexual abuse to me. My reference to her was in my Jan. 2013 Response to Mr. Furlong’s Notice of Civil Claim that alleges she was afraid of him when he yelled “Don’t talk Indian” and that he “kicked her bottom.” While class lists do not show Ms. West at Immaculata School, Mr. Furlong has stated he traveled Hwy 16 in that time period as the diocese sent him to a number of schools “along the corridor.” Ms. West attended St. Joseph’s, in Smithers, just off Hwy 16. Daniel Morice contacted me for the first time ten months after the Georgia Straight article appeared. In September, 2013, a year after my article appeared, he gave me a signed on-the-record statement alleging, amongst other abuses, sexual abuse. Not surprisingly, he is not listed in the Georgia Straight story or my Response. 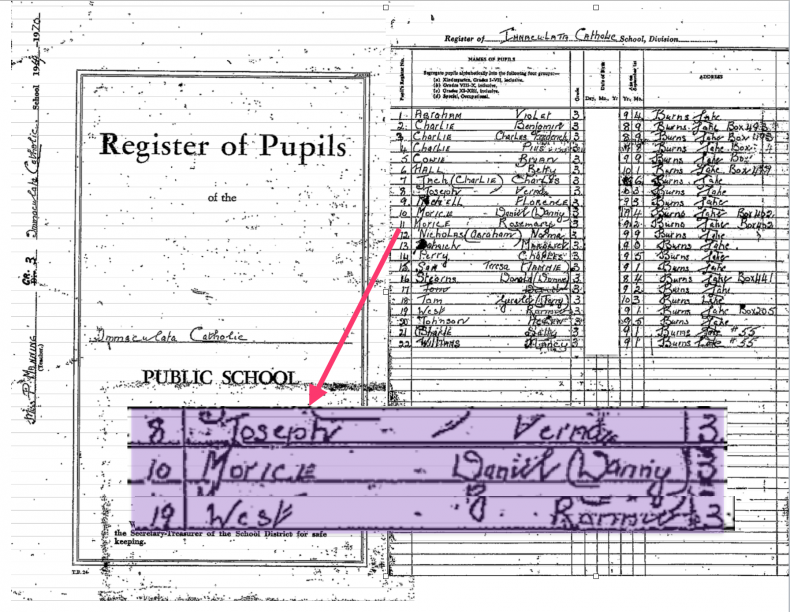 Unfortunately, Justice Wedge wrote that he did not attend Immaculata when Mr. Furlong was there when in fact, the school’s class list, which Father Gregoire Beaudette swore in an affidavit was accurate, shows him in gr. 2 in 1969 and gr. 3 in ’69-70. This exhibit was before Justice Wedge. I testified that in his affidavit, Ronnie West swore he witnessed Mr. Furlong abusing “Dan Morris”. The class list shows Mr. West was in Dan Morice’s class. Justice Wedge disallowed all statements/affidavits made by First Nations people as hearsay; she would not let me speak to the details of my research such as how many people gave me affidavits/statements or what they said and when they said it. In dozens of instances she made incorrect statements about First Nations people: what they said, why they said it and when they said it. I reported Justice Wedge to the Canadian Judicial Council. Unlike affidavits from First Nations people, Father Beaudette’s affidavit was accepted by Justice Wedge and she still erred in the reading of the class-list. It was common practice to shuttle First Nations children from school to school. Mr. Morice could have easily been at Lejac Residential School, which was at Fraser Lake, three lakes east of Burns Lake, in the same years he attended Immaculata. One tragedy of this story is that, despite all his years in diocese schools, Mr. Morice is illiterate. He could not read the lengthy legal documents that stated when he attended Lejac. Beverly Abraham was the third person to sue Mr. Furlong for sexual abuse. She dropped her claim, citing family stress as a number of people had recently died and her mother’s leg also had to be amputated. Mr. Furlong discontinued his suit against me, citing family stress. “There, attached to Kirchmeier’s three-page letter, among 50-odd pages, are some of the discredited sworn declarations, including the one from the woman whose criminal case was dismissed and who consented to her civil case also being dropped. The letter itself includes an excerpt from that declaration, and Kirchmeier wrote, ‘There has never been a forum in which the allegations were tested.’ The woman’s complaint was investigated and police couldn’t substantiate it, in large part because her story shifted so often. That decision was reviewed by the Alberta RCMP, lest the B.C. Mounties had goofed.” There are no discredited excerpts in Ms. Kirchmeirer’s letter to Dr. Ono. As stated above, Ms. Abraham dropped her case for reasons similar to Mr. Furlong. The RCMP’s investigation will, in part, determine whether or not Cpl. Mackie actually followed up on the 28 recommendations made by the Alberta RCMP concerning the investigation of Ms. Abraham’s allegation. The other seven affidavits cited in Ms. Kirchmeirer’s letter were not investigated or tested in court: they were disallowed by Justice Wedge. “The male complainant, attempting to be paid twice, was clearly riding the residential school train.” As stated above, Mr. Morice is on the class lists of Immaculata School during the time period Mr. Furlong taught there: this fact is sworn to by Father Gregoire Beaudette, in an affidavit supplied by Mr. Furlong. Records in University of Manitoba’s National Centre for Truth & Reconciliation show a significant decrease in students attending Lejac during that same time period. 1. Direct the Assembly of First Nations (AFN) to urge the federal government and the RCMP to conduct, as expeditiously as possible, a thorough and impartial investigation into the allegations of abuse brought by Mr. Furlong’s former students. 2. Direct the AFN to urge the federal government to meet, as expeditiously as possible, with the affected members of Lake Babine Band Council, Burns Lake Band Council, and any other affected former students to hear their concerns about the conduct of investigations and to discuss with them acceptable remedies. Perhaps UBC should use the funds that were to go to Mr. Furlong towards an invitation so the First Nations people who allege Mr. Furlong abused them at Immaculata or Prince George College can speak. Their voices may help dispel the endless speculation by those who have never interviewed or listened to them.